The Countryside team have been hard at work on all the ponds at Kelling Heath Holiday Park this winter. Particular attention has been paid to clearance work and vegetation management. March has arrived and we are beginning to see the results of our work. We have Mallards on the fishing pond along with the resident Moorhens. The Conservation pond is teeming with frogs and has a large quantity of fresh spawn amongst the new shoots of Sedge. New for 2017, we will be launching 2 new exciting activities for guests, Fishing for Families and an in depth pond analysis activity for adult visitors. 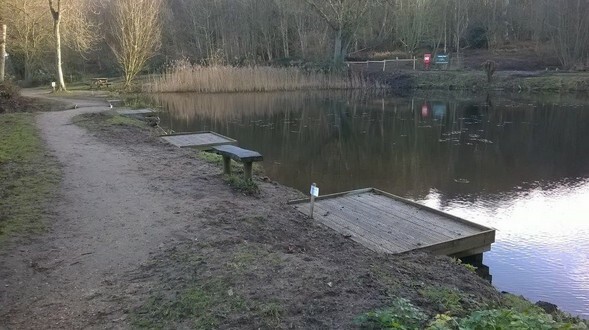 To enable this, our work on the fishing pond included 5 new angling platforms which will make fishing and pond dipping more accessible as well as helping to conserve the banks and marginal Rushes and Iris. Unfortunately due to damage to the various banks around the ponds we have had to install some signage regarding dogs and the necessity to prevent them from accessing the water and disturbing the wildlife and aquatic plants. If you are a dog owner please help us, the wildlife and the humans! by complying with the park rules and keeping your dog on a lead at all times. The coming weeks should see water temperatures rise, day length increasing and lush vegetation becoming a significant feature in both the conservation and fishing pond.